No region declared ‘most brilliant’. On 5 March 2019 the West African Examinations Council (Waec) released results of the year’s school certificate exam for private candidates. 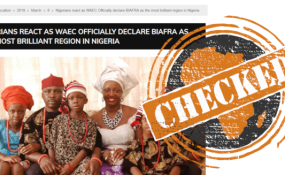 Three days later an online report claimed the council had declared Biafra the “most brilliant region in Nigeria”. The region known as Biafra is in the south of Nigeria. From 1967 to 1970 it was the site of a civil war for secession from the country. The independence of Biafra remains a subject of controversy . The report was published by Daily Advent on 8 March and its headline shared several times on Facebook . It includes a graphic ranking Nigeria’s states according to the 2018 Waec exam results. The graphic was published in August 2018 by Eduplana , a civic tech organisation that uses data to promote quality education in Nigeria. It shows all five states in Nigeria’s South-East region , part of what was known as Biafra, in the top 10. The ranking has been controversial , sparking comparisons between states, regions and ethnic groups. Oriyomi Ogunwale, project lead at Eduplana , told Africa Check the ranking was sourced from a media report after attempts to get data from Waec failed. But Waec Nigeria disowned the list on Twitter , telling people to “disregard it”. Eduplana has publicly asked Waec to upload its yearly results “so citizens can publicly access them”.